The former president says instead of removing statues, we should build our own as we have created our own history. National spokesperson of the Economic Freedom Fighters (EFF) Mbuyiseni Ndlozi has expressed his disagreement with former president Thabo Mbeki’s speech at the University of Mpumalanga during “The Thabo Mbeki I know Book Roadshow” on Thursday. In his speech, Mbeki addresses the #StatuesMustFall movement, calling it “pretence” and a “show”, further saying that it is movements such as these that lead to failure to attend to the “real” challenges. Last year the country was rocked by the #StatuesMustFall protests, with students from different universities calling for the removal of apartheid leaders. The movement saw the statues of apartheid leaders and colonial leaders defaced, with one of Cecil Rhodes being removed at the University of Cape Town. Mbeki says instead of looking to erase our past, we should build our own statues in addition, as we have created our own history and have our own heroes and heroines. However, taking to Twitter on Friday morning, Ndlozi says he disagrees with the former president. He says statues are not in the past, but the present and removing them from public spaces is not removing history but reshaping the present public space. Ndlozi says the purpose of statues is not “studying history”, it’s about celebrating it. “Imagine a statue of Bin Laden in the middle of New York City all cause they insist on remembering history/the past. “Okay since it’s about the past: let’s build a statue of Dimitri Tsafendas and donate it to Hendrik Verwoed’s family as a sign of remembering the past,” he says. Instead of putting these statues in the public space, “museums are where sober governments put statues of mass murderers”. His final suggestion was that government build a statue of Jacob Zuma in remembrance of history and put it in his yard. Watch the video of the former president’s speech. 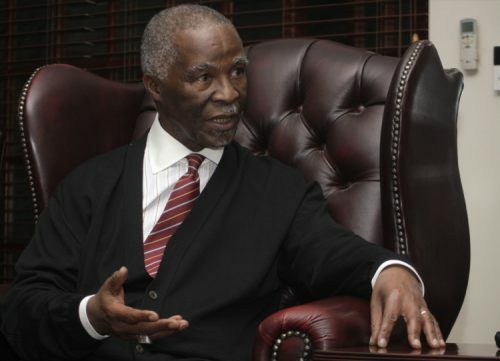 Mbeki said: “At the Union Buildings when I used to be there, I don’t know what the situation is now, when you entered through the back, driving from the western side of the building, you have what is called the Smuts lawn. It has got a bust of Jan Smuts, that is why it is called the Smuts lawn. “When you come into the building, there is a small alcove, and in that alcove is a bust of Jan van Riebeeck. So I told the story to some lady some time back, ans so she says to me, ‘how could you do that, how could you leave those things there’? “So I say but why not? ‘No no no, but those people were bad – Jan van Riebeeck, Jan Smuts!’ So I say to her, they are part of our history, we have created our own history, we’ve got our own heroes and heroines, why don’t we build our own statues in addition instead of saying remove this and that. “Because if you look at South Africa today, Professor Mammo Muchie, indeed as you were saying, we can’t deny this reality that even South Africa of today is made up partly of its past. You can’t say that by removing the statue of Paul Kruger you therefore removed that past, you haven’t.